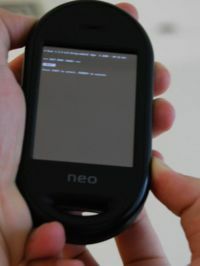 The Neo FreeRunner contains two FLASH memories: NOR FLASH and NAND FLASH. A boot loader is present in both memories. The normal power up uses the boot loader in NAND FLASH. NAND FLASH can be updated (written) using the boot loader and a utility (dfu_util) running on an attached host computer. NOR FLASH can not be written to using the boot loader. The reason for this is to provide a failsafe boot loader in NOR FLASH, in case the boot loader in NAND FLASH is corrupted while updating itself. You can power it up into an Openmoko image directly (default, when powered-on for the first time). You can boot it into the U-Boot bootloader via NAND Flash. You can boot it into U-Boot via NOR Flash. Booting the device into NAND and NOR Flash allows you to update the kernel and root filesystem. Press and hold Power button for about 8 seconds, until the Openmoko splash screen turns up. 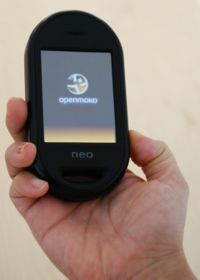 You may now release the Power button and the Neo FreeRunner will continue to boot into the Openmoko Image. The boot time to the "Today" page is about 2 minutes. Improvements are being discussed in the Booting time reduction plan. A boot menu will appear. This indicates the NAND flash has booted. Press the AUX button to select one of the options and then press the Power button to execute. This option is usually used by developers or when flashing (imaging) the FreeRunner. While still pressing the AUX button, press and hold the Power button. You should see the boot menu for the NOR Flash. This means you have entered the NOR flash. Flashing can be performed when the NOR boot menu is active. There are six options you can choose when you log into the NOR Flash. If you cannot log into U-Boot in NAND flash then you can log into U-Boot in the NOR flash instead. When flashing the device via USB connection, you must choose Set console to USB by pressing the AUX key until it is highlighted and then press the power button to select it. NOTE: The term Logging in used in this context means to turn on the device using the described method, and leaving it at the U-Boot menu. To avoid the device automatically booting, tap the AUX key to move the selector bar. Note also that the device will not automatically turn off while flashing is in progress. This page was last modified on 18 March 2010, at 23:54. This page has been accessed 40,704 times.